Surrender at 20: 1/18 PBE Update: Warwick skin tweaks, New summoner icons, tentative balance changes, & more! The PBE has been updated! As we continue the hunt for 7.2, today's update includes several changes to Warwick's updated skins, new summoner icons, balance changes, and more! The previously mentioned changes to Warwick's updated skins are included in today's update - Grey, Feral, Tundra Hunter, and Hyena Warwick all received changes such as ability recolors or more frequent laughs on Hyena. Context and discussion for these skin tweaks can be found here. Grey Warwick - changes and additions for today include VFX recolors for Q/E/R and W activation eye streak color change and four lines added to match helmet. Tundra Hunter Warwick - changes and additions for today includes icy VFX recolors on Q and R.
Hyena Warwick - changes and additions for today includes extra laughs added to long Q/R/W and when Hyena Warwick kills someone + vfx recolors for Q/R. Check back for full updated video previews closer to the end of the 7.2 PBE cycle! A new Koi Nami themed OCE Week icon and several new & updated esports team icons in today's update. 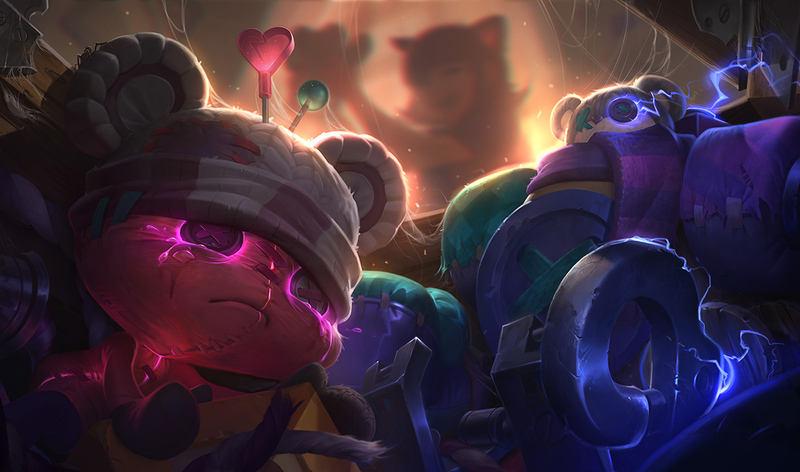 Sewn Chaos Blitzcrank splash is now mirrored - flipping Blitz on Right and Amumu on Left. Meddler noted the recent Riven E bug should be fixed in 7.2 pending final release testing. 1/13 PBE Update: Practice Tool enabled, Warwick login, Sewn Chaos splash art, and more!